David Riley, MD, is the director and co-founder of the Integrative Medicine Institute, an organization dedicated to facing healthcare challenges through practice-based research, case reports, and clinical practice guidelines. Dr. Riley has been an active participant in the medical research world, as an editor of three different peer-reviewed and indexed medical journals since 1995. In 2011, Dr. Riley was one of the lead developers of the CARE guidelines, a widely renowned framework for writing case reports. 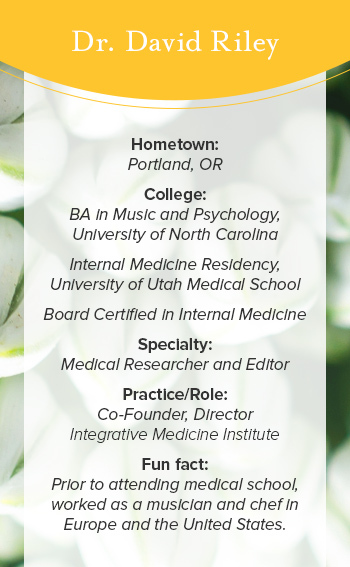 Currently living in Portland, Oregon, Dr. Riley interests range from music to cooking, and he holds true to his belief that health stems from the communities we all take part in. Question: What led you down the path to getting involved in the world of clinical research? Dr. Riley: The real starting point for me was in 1995 when I was invited to work as the editor for Alternative Therapies, which was one of the first peer-reviewed and soon indexed medical journals in integrative medicine. I realized I enjoyed being an editor, which allows you to explore and be exposed to things which you might not be that familiar with, and then begin to investigate the evidence for a given therapy. This is more than just someone’s opinion, which counts for something, but provides clinical expertise as well. What are case reports, and how did you become interested in them? Case reports are records written by medical professionals that outline the diagnosis, treatment, and outcomes of the medical problems of patients. They are written in a narrative style, and are extremely useful in providing early signals of effectiveness, adverse events, and cost. I was particularly interested in case reports because I felt that was an area that was not being investigated by anyone in medicine, in the systematic way. If you were to have an industry that spends a lot of money on research and development you would expect them to also spend money on what the outcomes of that are. When you develop a product, you implement it, and you sell it, but what happens to all the people who use it? We spend over 200 million dollars a year in medical research, but we don’t really have a well-developed program for tracking outcomes of what happens in clinical practice. What makes a good case report? A good case report tells a story about what happened from an episode of care for a patient, but it also has data. Data without a story may be useful but is often boring, and a good story without any data may not be believable and is just an anecdote. You have to find a sweet spot in between where you tell a compelling story, with the right amount of data that demonstrates that what you did has at least a plausible chance of being associated with what happened. But it’s not a linear story. I can’t tell people, “If you collect X, Y, and Z on all your patients, you will have a good case report.” Each case report is different and there are lots of twists and turns in them. And how does this lead you to developing the CARE guidelines? Over the course of time we called up a large group of experts individually, to help create guidelines that would answer this question. We formally began this process in 2011. In the fall of 2012, we brought a group of experts together for a consensus conference to develop draft guidelines for case reports. We prepared an article on these guidelines - the CARE guidelines for publication in 2013 - and were fortunate to be able to present the CARE guidelines to the International Congress on Peer Review and Biomedical Publication in Chicago in September 2013. The Congress is cosponsored by the Journal of the American Medical Association (JAMA) and the BMJ. Since then, the guidelines have been published and endorsed in multiple medical journals, and translated into nine different languages. We’re trying to increase the visibility of credibility of cases reports and begin to “shift the Titanic” if you will, in terms of providing a tool for patients, clinicians, and researchers to pay closer attention to case reports. We think all of medicine will benefit. How does this impact the realm of patient care? If you look at the pharmaceutical model of a drug for a disease, that ‘one drug for one disease’ model maybe works best in acute disease. But when we’re dealing with chronic disease, we’re never going to have enough randomized control trials to look at all the permutations that are possible with each individual patient. For example, if somebody comes in with three conditions and you have trial evidence available on each one of those conditions, how do you know what to do when you have all three of those conditions together? There is not research evidence available. The best clinicians rely on their clinical expertise, as well as external evidence. If data is systematically collected from the point of care where clinicians are seeing patients, we have the ability to collect this information and might be able to inform clinical practice guidelines. If you can begin to create a mindset among clinicians and healthcare systems about systematically collecting clinical data, two things could happen. One, you improve patient care. Two, practitioners and clinicians might realize that research is something that they can do within their own practice. They are part of this bigger community and it’s not researchers on one side and clinicians on the other. They’re linked. Is there a specific intersection where Integrative Medicine becomes applicable with case reports? I think we’re never going to have enough clinical trials to validate the complexities and nuances of integrative medicine and individualize approaches to care. I also think that systematically collected and reported case reports offer a way to begin to provide some evidence about how different therapies can be used to treat conditions and how they are being used by patients. There are people with multiple medical problems. There may be several therapies being used at the same time you might try, ranging from acupuncture to naturopathic care to an elimination diet. If you begin to document how those therapies were implemented, and what the sequence was, you’re of course not going to be able to point to a specific therapy that cured it all. But you’re going to show that these therapies may be able to be effectively integrated and that you can have outcomes from patients who integrate some of these therapies. Read more about the CARE guidelines.